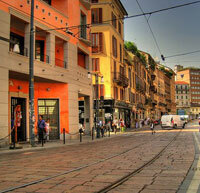 Milan's southernmost zone is popular with young people-many of whom go to the university located in the district and people who don't mind a walk from the district's trendy night spots to their parking places. Locals can forgo cars altogether, as the transportation facilities are good and the commercial centre is within walking distance of some residential areas. Zone 5 is the least densely populated of Milan's zones. 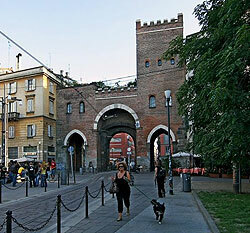 Porta Ticinese is the name of an old gate, once part of the city fortifications built by the Spanish. The gate, close to the church of San Lorenzo Maggiore, has become a place for youths to gather at night. The neighbourhood around San Lorenzo has become a popular nightlife area, but one with a more authentic Milanese atmosphere than Corso Como. Across from the San Lorenzo church stands an ancient Roman colonnade, one of the few Roman remains left in the city. Leading south from San Lorenzo is the street of Corso di Porta Ticinese, a mecca of hip, urban fashion stores like Diesel, Stussy, Quicksilver, Energie, and Fornarina. The Porta Ticinese area features many old-fashioned case a ringhiera, low-rise apartment buildings characterised by long balconies and set around small central courtyards. The streets here have a medieval appearance and don't offer a lot of space for parking, but you can easily live here without a car; the Porta Ticinese area is not far from the city centre and features good public transportation links.